In line with Samsung's Galaxy S3, the Galaxy Note 2 features 5.5-inch HD Super AMOLED display with 1280x720-pixel resolution and 16:9 aspect ratio, blazing quad-core processor, Android 4.1 Jelly Bean OS, 3100mAh battery and 2GB RAM. With such remarkable features, Galaxy Note 2 no doubt gives Apple's iPhone 5 a run for its money. The high-resolution wide screen and long battery life make Galaxy Note 2 terrific for movie watching. However, don't count your chickens before they hatch. You cannot play all videos on Galaxy Note 2. Then, what video and audio formats can be played on Galaxy Note 2? Let's have a look first. As above, only a few video and audio formats are supported by Galaxy Note 2. If you have many other videos in the formats of VOB, MOV, M2TS, AVCHD, MOD, etc and want to play on Galaxy Note 2, you will have to convert video to Galaxy Note 2 recognized formats beforehand. In this case , you will be in urgent need of a specialized video converter for Galaxy Note 2, helping you quickly fulfill the video conversion task. 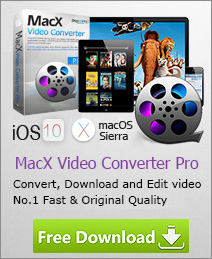 Here, MacX Video Converter Pro is highly recommended to you. This software delivers a seamless conversion from videos like MKV, MOV, AVCHD, FLV, AVI and M2TS to Galaxy Note 2 on Mac computer with top video quality and high efficiency. Therefore, you can play any video on Galaxy Note 2 as you please. In order to play video on Galaxy Note 2, you should download and run this video processing software on your Mac computer first and then click "Add File" button to load the video file. Since you want to convert video to Galaxy Note 2, here you can choose "to Android Mobile" -> "to Samsung Mobile Video" and choose Galaxy Note 2 as the output format. Besides, you also can customize your video by adjusting video resolution, frame rate, etc. 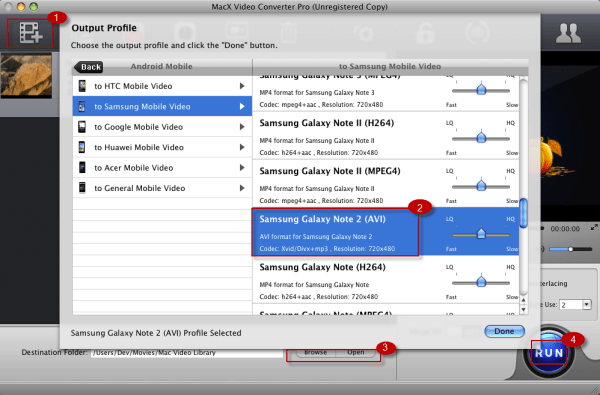 After finishing the above steps, you can start converting video to Galaxy Note 2 on Mac OS X by clicking the "RUN" button. You could view the conversion progress or cancel the process at anytime.